I got in contact with Chris Keenan, who is a producer and a designer at inXile, to chat about the upcoming Wasteland 2. The creators of Wasteland 2 have some interesting ideas about giving back to the community, particularly through their Kicking it Forward initiative (more on this later). Aside from spawning the aforementioned initiative, inXile has committed to a DRM free version of Wasteland 2, as is the growing trend among both Indie and well established developers alike. inXile is building quite a reputation for listening to their fans and providing the type of game that the faithful are demanding. So let’s dive into it shall we? Steve: So what is Wasteland 2? 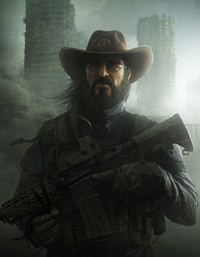 Chris: Wasteland 2 is the direct sequel to the first ever post-apocalyptic computer RPG. 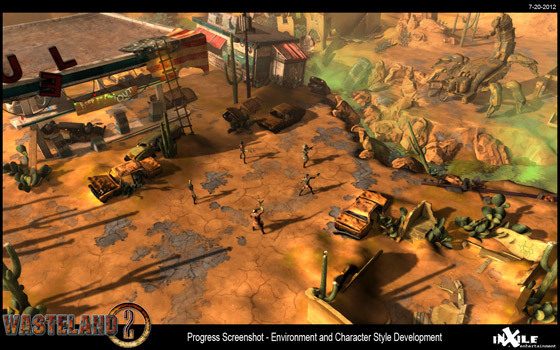 The original Wasteland was the inspiration for the FALLOUT series of games, and the first RPG to allow players to split parties for tactical considerations, to face players with moral choices, and to make them deal with the consequences of their actions. It was the first to provide far more than the one-key-for-one-lock style of puzzle solving. It was groundbreaking, which is why IGN named it one of the top 25 PC games of all time. In fact, Computer Gaming World named it the Adventure Game of the year in 1988, and it was short-listed for inclusion in the Smithsonian Institution’s current “Art of the Computer Game” exhibition. Steve: For those who don’t know, what was the original Wasteland like? Chris: In the early 1970’s, Earth’s scientists discovered a cluster of meteors heading towards Earth. The United States immediately began constructing an orbital nuclear anti-meteor missile platform. Hoping that this orbital platform would be their salvation, Earth is thrown into disarray when all of the satellites are unexpectedly wiped from the sky by a small cloud of meteorites which preceded the main cluster. In response, each of the great powers sent 90% of their nuclear arsenal skyward. 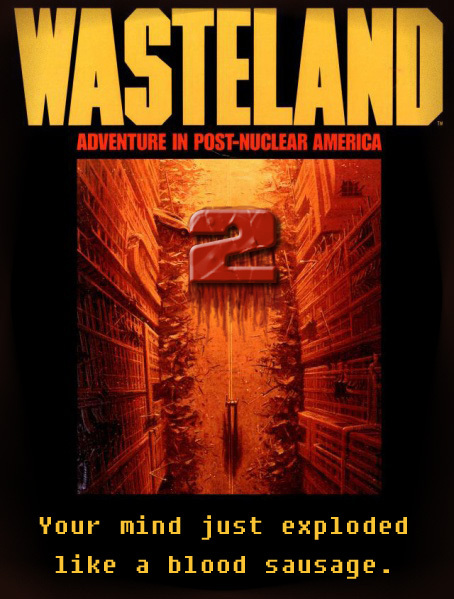 Wasteland is set in 2087, following the nuclear war of 1998. The player controls a group of Desert Rangers which attempt to navigate their battered world and bring some order to the world. Steve: Can you describe the evolution of Wasteland 2? Why make a sequel after so long? Chris: Brian Fargo has wanted to make Wasteland 2 since he finished the first one. Unfortunately at the time, he wasn’t able to secure the rights from EA. The Wasteland team had learned a ton and had some great ideas that they wanted to incorporate into another post apocalyptic game. Since they couldn’t do Wasteland 2, they started the Fallout franchise instead. Steve: Can you talk a little about the core game play of Wasteland 2? Chris: Wasteland 2 reintroduces the concept of party driven adventuring, a style of game-play untapped for many years. Having a party of characters will re-introduce game-play dynamics rarely seen in today’s RPGs. As a team of Desert Rangers, it is your job to restore order in this lawless post-apocalyptic landscape. How you do it is up to you. Interact with hundreds of characters across the world, shaping your own destiny. Who you choose for your team will add dimension to your party interactions, opening new possibilities for you to explore. With gangs, cultists and bizarre creatures at every turn, some problems often can only be settled at the end of a gun. As you and your team gain experience, it is up to you to shape your team’s skills and abilities, building the perfect fighting force. Like the original Wasteland, your choice of what statistics and skills you invest in gives your characters personality, gives you multiple quest solutions, and gives you the ability to role-play beyond simply Thief, Fighter, or Mage archetypes. A low Charisma, low Agility, and high Strength character who specializes in medical skills and brawling can flesh out your characters with a sense of personality that other RPGs don’t allow for . In addition to your ranger party you will have NPCs join the group each with their own personalities, motivations, and agendas – while they may excel in lockpicking, swinging a chainsaw through Leather Jerks, or sniping a War Droid and clipping its sensors at a block away, they have their own opinions they’ll act on over the course of the game. They don’t always blindly follow you into radiation-infested buildings, they may quietly hoard drugs and money that they find, or even possibly decide to borrow things from you as needed. Steve: I am interested about inXile’s choices both in terms of listening to their fans and why they would choose to support Linux. Chris: The idea to Kickstart Wasteland 2 came from years of fans messaging our CEO, Brian Fargo and telling him they’d like to see a new version made. As soon as Double Fine showed that the crowd sourced method of financing larger games is possible, Brian immediately thought of Wasteland. We then opened up forums and put the hint out that we were entertaining the idea of a sequel. The fans and press went crazy. Before we went live with the Kickstarter, we dropped the reward tiers on our forums and asked for feedback. We got some great information on how we could modify the rewards and did so prior to going live. That really helped to solidify that we are making the game for our fans, so why not ask them what they want all along the development process. Of course, we hold a vision for what we want the game to be and try to focus the conversations with the main pillars of the game but we have been open to many great discussions and modifications. If you compare the forum discussions at the time to our vision document, I think you’ll find many parallels. During the Kickstarter drive, our president Matt Findley and myself were answering all of the private messages that came our way. Every hour, we would talk about the general feel of what people were saying and asking for. At least 20% of the messages were about getting a linux version. We then evaluated internally as quickly as possible what it would take to do that and set a stretch goal to include this option for the fans. Steve: Can you also address your experiences with Kickstarter in general? What are your thoughts upon reflection of your Kickstarter project? Would you do anything differently next time? Chris: The entire Kickstarter movement has been amazing. There are so many positives to this new form of funding that it’s difficult to speak concisely on it. As an independent developer, we employ a group of people that have the knowledge and passion to make games. It’s what we do best. Being able to focus on this element and not deal with the many outside influences and distractions that come along with the developer/publisher relationship is a godsend. I’m not speaking on the necessity of some of these elements but more the freedom that we have to focus on what is most important to the play experience. In the end, our thinking comes down to that key point. The Kickstarter campaign created a very interesting bond between us and our fans. When you accept money from a publisher to create a game, you ultimately know that thousands of people will be playing the game but you feel a bit removed for so long since there isn’t any day to day interaction with the fans. You work in a bubble for a few years, then get to hear feedback from people once they’ve played the game. By that point, the game is on the shelf and you take notes if you’re lucky enough to make sequel. We had the privilege to be able to listen to our community early and make adjustments to suit their wants. I think we learned a quite a bit from going through the process. We had no idea how exciting and fast paced the 30 days would be. I’m not sure that we were fully ready for the amount of time required to run a successful campaign. Many of us were on 18-20 hour shifts out of pure fascination. Steve: With the Kickstarter funding will you expect to break even at launch? Chris: At best, we would come close to breaking even, but I’m not sure that’s going to happen. The game we’ve designed is quite a bit larger than we had intended. It’s amazing how quickly 3 million can go when you’re talking about a team’s overhead for 2 years. Steve: What game engine are you building upon to allow cross-platform gaming? Unity Technologies, was among the vendors that came to us with congratulations, goodwill and offers of support. Their engine stood out as an early front-runner on point 1 of our requirements. The artists loved its support for the native formats of the art tools we already use (3DS Max and Photoshop). At first it seemed to be missing a leg on point 2 (support for Linux platform), but [we] knew that we could get source code and therefore could provide the Linux port ourselves. Given that the engine is designed and structured to support multiple platforms, [we] felt it would not be insurmountable to port it to Linux (or actually hire some outstanding external contractors we’ve used before to do the job). After talking to Unity about this, we found they’ve already been working on a Linux port, so Unity is supplying inXile the Linux port alpha source code. inXile will work with Unity in order to port Wasteland 2 to Linux. Where Unity really bowled us over was on point 3. Besides generous support available from Unity staff, the Unity Asset Store is a treasure trove of assets (3D models and code) provided by the large and growing community of Unity users. We’ve been able to find all kinds of useful 3D assets and code in the Asset Store ranging in price from cheap to free! Having an organized marketplace like the Asset Store for finding assets and expertise fits right in with our desire to leverage and give back to the community. While we cannot share engine source code changes, we can share script code and components, as well as graphical assets as part of our modding support. From looking at Unity demos, other games developed with Unity, and conducting our own art and coding tests, we are convinced that Unity delivers on the game system that we need to build Wasteland 2 in style. This includes advanced 3D rendering, pathing, physics (PhysX), multiple options for scripting language, advanced 3D level editor that is customizable with scripted components, and much more. Steve: Moving on to some other aspects within the game, will there be a crafting in Wasteland 2? Chris: We have designed a crafting system for the game. Players will come across various components throughout the Wasteland and use them at benches around the world to create items. What you can create and how successful you are depends on that characters skill level in relation to the bench you are using. Steve: Is community modding a possibility in the future? Chris: Yes. We’ve actually committed to creating a mod kit for the game. More than likely, it will not be ready at launch but we are already planning for it and talking to the leaders in the mod community. The guys at Nexus have been great at putting us in touch with some of the top modders for the Fallout communities. Even though we’re not working on it, we want to make sure that the engineering plan lines up with a system that will be easy for modders to tweak. We want the content to live on after we’ve finished the game. Steve: In terms of additional content, will you being doing DLC or expansion packs? Chris: Right now, we’re only focusing on the regular game. We want to make sure the experience we’ve promised is as good as people are expecting. Steve: How will customers be able to purchase Wasteland 2? Steve: Open forum, is there anything you would like people to know about the game, your company or your vision? Chris: Absolutely, our vision is to continue working directly for our fans from this point forward. We firmly believe that the best games will come from teams that don’t have to worry about any outside influences coming from marketing or sales on the hot new thing that has to be represented in the game. We are able to trust our instincts and validate those through communication with the fans. Our team is able to focus on what we do best and the fans can get what they want. It’s a win-win. inXile is hoping to seed the Kickstarter community with Kicking-It-Forward as well. This was a brilliant idea by Brian that says that 5% of all profits after ship get put back into the Kickstarter community to help fund other small to mid-sized developers. We have currently had 119 projects funded successfully that are supporting the initiative and hopefully it keeps growing. Recently, Obsidian joined that group as well, so it’s off to a great start. Steve: Thanks for taking the time to chat with us. Good luck on the rest of the development cycle! Any project creator that puts the KickingItForward.org URL on their Kickstarter project page is agreeing that they will put 5% of their finished product profits back into other Kickstarter projects. To be abundantly clear, this is only money that the creator earns as profit AFTER the project ships and AFTER they have paid their expenses. This is NOT a suggestion to invest money they received from people who invested into their project via Kickstarter. inXile is the embodiment of the Linux community’s values. I, for one, think it is quite amazing that a developer would pledge 5% of their own profits to support their industry. inXile is not doing this in isolation, but rather they are building a community of developers who are agreeing to help each other. As mentioned, Project Eternity has already committed to ‘Kicking-it-Forward’, but they are not alone! There are currently 121 funded projects and 31 active projects on Kickstarter which have also committed to Brian’s incredible initiative. Perhaps the age of fan driven development is upon us at last. Shadowrun Online, Folk Tale and other great games are making their way to Linux via Kickstarter, and we sat down with them to get the details. Stay tuned for more from developers who are listening to their fans and providing support for the penguin! I agree, I already am playing great games such as FTL, Rochard, Torchlight, Trine 1 & 2 and other high quality games natively on Linux. With Steam's client immanent it is a great time for the budding game industry on Linux!